I do love a jilted bride story. I’m not sure why--I’ve never gotten close enough to the altar to be be jilted--but I think it has to do with my fear of rejection and being jilted at the altar is the ultimate rejection. Anyway, it’s like what a secret baby trope is for other readers: kryptonite. Laurie, lying in the wreckage of her new single life, is now realizing how much she was giving up to be with Brandon. Not the dating other men part. No one actually likes dating--it’s brutal out there--but the fact she passed up a job that would have been great for her and her career to be with him. She bought a house she didn’t really want because he insisted on it--and the mortgage is in her name. The relocation to this small town of Shenandoah Falls is also a step down. Oh, and Brandon also went on their honeymoon without her--which she had paid for. Of course, in this stage of grief, she’s not sure she wouldn’t take Brandon back if he came to his senses, but on paper, she’s beginning to see he might have done her a favor. Andrew Lyndon has a bad habit of doing a job so well, he keeps getting tasked with it. Such is the case with being so efficient at helping Laurie out of her humiliating position, now her father wants Andrew to find appropriate men for Laurie to date--and to make sure Brandon sees it. Andrew is one of two lawyers at the firm that is vying for a partnership within the company. Therefore when his boss, Laurie’s father, says do something, he has to do it, regardless how distasteful, ethically questionable, or awkward in regards to his social relationships, he finds the task. Eventually Andrew convinces Laurie to her father’s scheme; and soon Laurie is going out on dates (really bad ones)--but more importantly, Brandon sees this going on and he is jealous. After all, he didn’t actually think Laurie would go through with it. Then Brandon decides she’s only dating to make him jealous and that’s never going to work. But he keeps tabs nonetheless; and he’s certainly upset every time she’s out with someone new, having a good time. The story is an interesting blend of complications you may have always wondered. Who gets the friends when you and a significant other break up? When you meet their friends out in public, are you allowed to talk to them or are you supposed to act like you didn’t see each other to prevent awkwardness? What do you do about the sister-in-law that never was who you were looking forward to being sisters with--and now you can’t be friends because her allegiance belongs to her idiot brother? The girlfriend relationships are forged almost immediately--and just as strong as if they were forged at birth. It was a compelling story with very likable characters, with the notable exception of Brandon, obviously. Who I don’t mind saying does not win Laurie back because she clearly deserves so much better. But the story of how Laurie got her groove back, set some healthy boundaries, and has her own little montage of Sisters Doing It For Themselves as she becomes a heroine to root for--that’s worth reading. 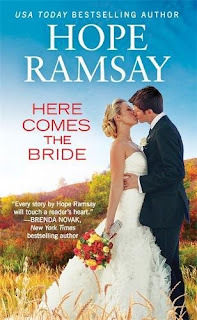 I look forward to finding the first book in this series (A Small Town Bride) and the others in this series. I especially want to see the story with Courtney--now her story is going to be a reckoning. This one sounds great! I'll be looking for it, and the others in this series. PJ, you have presented me with another book which sounds like something I must add to my TBR pile. Thanks. Another great review, Hellie! I haven't read a Hope Ramsay book in a while. I think I should check out this series. This is a trope that is used often and can be difficult to make fresh. It sounds like Hope Ramsay has done an excellent job of doing just that. I will be looking for this one. Wonderful review. I look forward to reading this book.